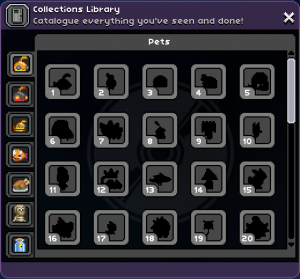 The collections library window is filled out as the player collects specific things throughout the universe. It can be accessed using a button in the side menu, just above the Matter Manipulator upgrade window and below the Codex window buttons. Initially each entry is empty, with a silhouette of the missing entry. After a required collectible is collected a message notifies the player that they've added an entry to their collection, and the image appears inside the collection window. Mousing over the image will display a description for that entry. Collection requirements for pets, action figures, cooking, fossils, and bugs can be completed by sharing the required item with other players. Fishing must be completed by the character, because the entries are filled when the fish is caught using a Fishing Rod. Collections are filled in per character, so each individual character has their own completion for their collections. Filling in collections has no impact on gameplay and isn't required for any progression. After completing an entire collection a gold star will appear on that collection tab inside the Collections Library window. Pets 57 Capture unique monsters inside Capture Pods to complete each entry. Action Figures 65 Collect figurines which have a chance to drop from unique monsters and bosses. Fishing 48 Catch unique fish using a Fishing Rod. Cooking 150 Cooking each recipe available in game using a Kitchen Counter. Fossils 23 Collect the pieces for and complete each fossil available in game. Bugs 42 Catch bugs from each planet type using a Bug Net. This page was last modified on 16 September 2016, at 20:31.